Did you go to any Mardi Gras parades this year? If so, you probably brought home lots of Mardi Gras beads along with your great memories. Left-over Mardi Gras beads inspired us to come up with some easy Mardi Gras bead crafts. Here are some of our ideas for reusing Mardi Gras beads. using only Mardi Gras beads, stiff cardboard and hot glue. *Mardi Gras beads and ribbon can be purchased at www.MardiGrasOutlet.com. If you caught beads at Mardi Gras and if you have these common craft supplies, this project is free! Otherwise, a pack of these gold beads is only $3, and you get 48 strands which is more than enough to make several letters. First, print-out a large letter of your choice on your home desktop printer. Use a word processing program on your computer and make the letter as large as you can fit onto a page. The font used here is Monotype Corsiva, and it is 7" tall by 8" wide. Cut out the letter from the print-out, and then use a pencil to trace around the edges onto a piece of scrap cardboard. Use an x-acto knife or scissors to cut out the letter shape. Cut each of the Mardi Gras beads into single strands. You can use gold beads like this letter or other colors. If you have multiple colors of Mardi Gras beads, simply spray paint the letter when you are done. Use hot glue or skillet glue to attach the beads to the cardboard. Skillet glue is hot glue that is heated in a pan or crock-pot. Wrap the beads strands around the entire letter, back and front. Make sure the strands stay going in the same direction, and place them close together so that they interlock. This makes the gaps smaller, giving the letter a mosaic look. Now you have the option of spray-painting the monogram letter with the color you want, or leaving it as is. To make the letter into a wall hanging, simply tie a ribbon and a bow at the top. We used metallic gold deco flex tubing ribbon to create the bow and hanger. The same idea for making a monogram letter can be used for almost any other shape as well. We also created a 5" square picture frame made from Mardi Gras beads, as shown below. Click here to see a previous post for creating this beaded chandelier. Still looking for more Mardi Gras bead crafts? 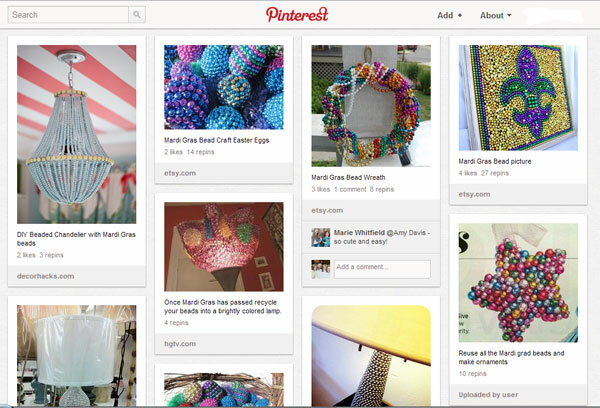 Check out our Pinterest page for lots of other inspiring Mardi Gras bead crafts. You will find lots of great ideas for reusing and recycling Mardi Gras beads such as coasters, Easter eggs, vase fillers, ornaments, decorations, lamps, mosaic art and more! Thanks for doing this! These are great ideas! Glad you enjoyed the ideas! I have used your site to make the Deco Ribbon Wreaths, your videos make them so much simplier to understand, have now come back to check out other projects. Thank You! !